Hope you all are having (or had) a happy weekend. It is the month of India’s biggest and grandest festival, Diwali, and it is raining offers and discounts. Be it clothing, home appliances, jewellery, or beauty products, there is a sale on pretty much everything. While everyone out there is busy shopping this weekend, I decided to stay home and watch some TV, and also give the next recipe some thought. 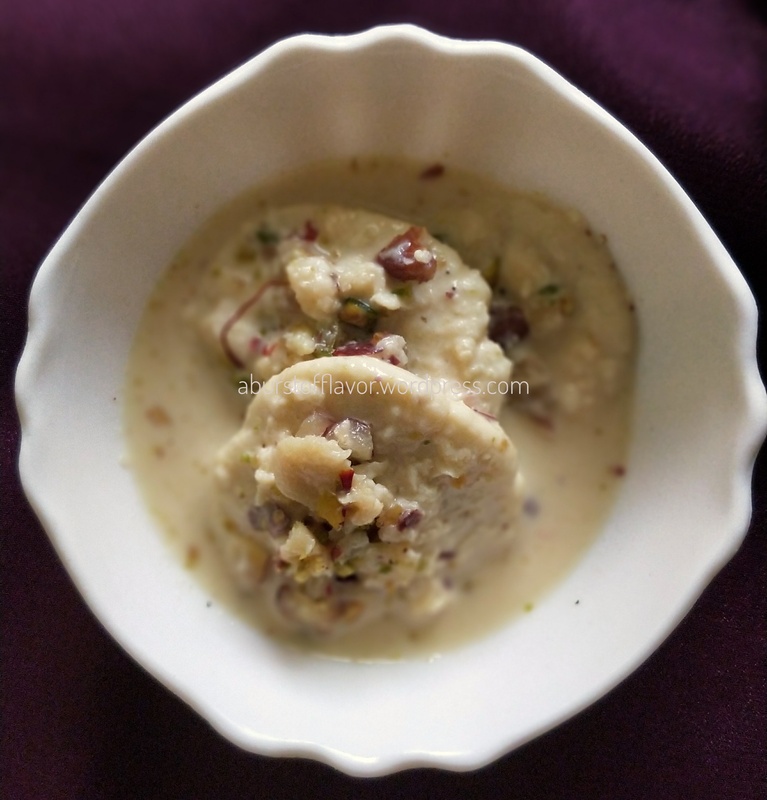 I have been waiting to make this recipe for a while now, and after days of procrastination, here it is (drum rolls please), Rasmalai. Now, let me tell you, the whole process of making Rasmalai can be quite tedious and may even look slightly intimidating at first. In fact, you may even wonder if you really want to give this recipe a shot, but trust me, it is going to be worth your every effort. Rasmalai (ras: juice, malai: cream) is an extremely popular and well-loved Indian/Pakistani/Bangladeshi sweet that is of Bengali origin [Source: Wikipedia]. It primarily consists of a cottage cheese ball/roundel (presoaked in a light sugar syrup), suspended in rabdi (a gorgeous, rich and creamy milk base with flavours of saffron and cardamom, garnished with chopped nuts). This is officially my longest step-by-step recipe so far. I have tried to make the method look as simple as possible, as the process is only a bit long and time-consuming but not very tough, in my opinion. If you pay careful attention at every step of the way, it is going to turn out beautifully. This oh-so-creamy sweet recipe, received a lot of compliments, especially from my mum who is not very easy to impress! 😀 I hope you will love making as well as relishing this as much as we did! Start with about half a litre of whole, full fat milk. Bring it to a boil. Then, bring the flame down to a simmer. You should get a layer of cream on top by now. Gently, start sticking the creamy layer on to the sides of the pan making sure to stir the milk continuously. This will ensure that the milk does not burn or stick to the pan. Add in your sugar, followed by the sweetened condensed milk. Give it a good mix and continue to stir while sticking the cream on to the sides of the pan. Continue this process until the milk boils down to about half its volume. Again, make sure to stir it so that the milk does not burn. As you can see in the above picture, the reduced milk has changed to an off-white colour. Now is the time to add in your saffron, cardamom powder and chopped nuts. Mix well. Scrape all the cream as much as you can from the sides of the pan and mix it back into the milk. Your rabdi is now ready. Set aside. Take a litre of milk and bring it to a boil. Then, bring your flame down to low and squeeze the lemon (if you are using vinegar, then one teaspoon at a time). The milk will slowly break and curdle to form milk solids. Drain this in a muslin cloth. Then wrap the muslin cloth as shown, and dip it in tap water to cool it down a little. Now, squeeze the excess water as much as you can with gentle pressure. Remove the cloth. This is your freshly made chenna or paneer (cottage cheese). The chenna has a crumbly texture. So, knead this until it forms an almost smooth looking dough. It takes close to 10 minutes of kneading to get this texture. Once the dough is ready, divide them into smaller portions and shape them into flat roundels: First shape them into small spheres and then flatten them as you go. Once they have all been shaped, cover them with a muslin cloth to ensure they remain moist. Otherwise the rasagullas will turn out slightly hard in texture. Meanwhile, heat 4 cups of water. Bring it to a boil, then add your sugar (3/4th to a cup depending on the sweetness of your sugar) and let it dissolve completely. A light sugar syrup is now ready. Bring this syrup to a rolling boil, and drop your dough roundels in one by one very carefully, as these tend to break very easily. Cover, and let them cook for 10 minutes on a medium flame. They will now have doubled in size like in the below picture. Turn off the flame and remove your prepared rasagullas one by one. Place them in a tray and pour some of the sugar syrup over them. Let them cool down for about 10-15 minutes. Then, set aside. Side note: As you can see, some of them have developed broken edges. It is extremely important to be very delicate while dropping them as well as removing them. Nevertheless, they will retain their shape when they cool down completely. Once the rasagullas have have cooled down completely, you will see that they are a lot more firm in texture and start looking a bit pale. Now, press each rasagulla one by one (again, do not press too hard), from all sides to remove the excess syrup. Take your rabdi and start pouring it over the prepared rasagullas. Add more chopped nuts if required. Make sure you stir the milk continuously AND keep your flame at its lowest throughout while making your rabdi, otherwise it will have a burnt after-taste. When you are attempting to scrape the cream, dampen it with some of the milk from the pan so it comes off easily. The dough for the rasagullas needs to be soft and smooth. Make sure to knead it really, really well. Otherwise, your rasagullas will break while they are boiling in the sugar syrup (Thankfully, none of mine broke, but some of them had visible cracks). Use a pot wide enough to accommodate all the dough balls as they will double in size. Otherwise, they get caught between each other, and tend to stick to one another. Some of my rasagullas were thin at the edges (hence, the cracks), so I would suggest rolling them thick and even, before dropping them into the boiling sugar syrup. Make sure your sugar syrup is light, otherwise it will not penetrate the dough balls. I added about 4 cups of water for 3/4 cup of sugar. I added 5-6 teaspoons of sugar for the rabdi because my condensed milk was already sweetened. Adjust accordingly if you are using only milk. However, it will prolong the process of milk reduction. Beautiful share! One of my favourites!! Great recipe for this Diwali !